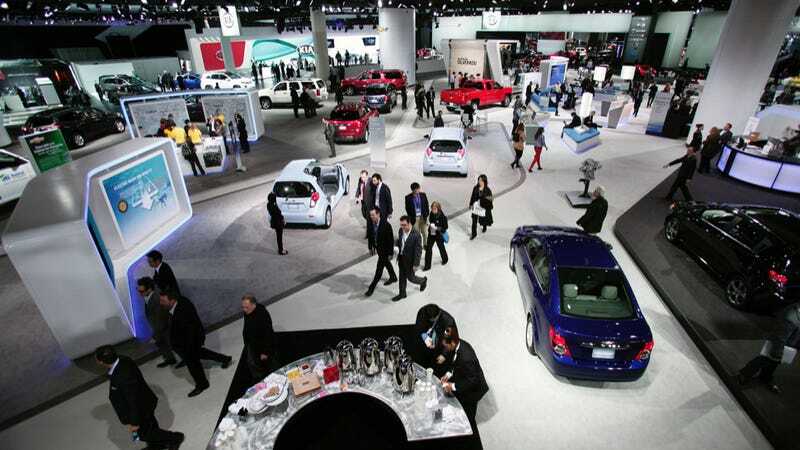 Next week is the first big one of 2014, the North American International Auto Show in Detroit. So what do you need to be on the lookout for? Let's break it down. The show will unofficially start Sunday night with the reveal of the GMC Canyon and a number of other small events, but will properly get underway on Monday morning and last all the way until Tuesday when the debuts end and it opens to the public. There's a lot of ground to cover. We'll be live on the scene, so follow along on our Detroit Auto Show tag page. You can also follow each of us individually on Twitter as we're at the reveals, Tweeting what will no doubt be info, sarcasm, photos, or a combination of the three: Matt Hardigree, Travis Okulski, Jason Torchinsky, Patrick George, Raphael Orlove, Zac Estrada, Andrew Collins, and Aaron Foley. Of course, the big news from Ford will be the debut of the all-new F-150, which is supposed to be revolutionary and chock full of aluminum to lower the weight. It might even get a small displacement EcoBoost V6. We'll be covering it in-depth over on our new truck blog, Truck Yeah. The 2015 Mustang will also be there, but you've heard about that a lot already. Toyota is expected to show off the Mirai Concept, which people really know nothing about. The only thing we've heard is that it just might foreshadow a new Supra, which is a great thing. Of course, a "new Supra" has been coming for eons, so don't get your hopes up too high. Will The Toyota Mirai Concept Be The Next Supra In Disguise? Chrysler will be showing a new 200, which is being called "not terrible." That's a massive improvement from the old 200, which was just "terrible." This will have either the TigerShark I4 or a Pentastar V6 and available all-wheel drive. They'll also have "rotary shifting," which is exciting, I guess. Still, the new 200 looks quite swell, so we're excited to get up close with it. In addition, Dodge might show off a supercharged, 640 horsepower version of the Challenger known as the SRT Hellcat. Best car name ever? Probably. Will Dodge Show Its Hellcat-Powered Satan Spawn Challenger Next Week? Here's the show stopper. The 2015 Chevrolet Corvette Z06 will make its debut on Monday morning. It should have 620 horsepower, 650 pound feet of torque, and make mincemeat of nearly every single car on the road. It'll be joined on the stand by the Corvette C7.R, the latest racing 'Vette to make the trip to Le Mans. Over on the GMC side, we'll see the Canyon, which will be a Chevy Colorado but slightly different. The 2015 C-Class will make its world debut. Think CLA, but larger. Or C-Class but CLA-ier. The 2015 S600 will also make an appearance, which is the S550 with a V12 and some different badging. Nothing you haven't already seen from BMW. We'll have the US debut of the 2-series as well as the public premiere of the 430 horsepower M3 sedan and M4 coupe. Looking forward to seeing these two in the flesh. As if there weren't enough variants of the 911, Porsche will show off the Targa 4 and Targa 4S. While we've seen them in a leaked dealer presentation, this will be our first chance to glimpse it in person. And rumor has it that the roof mechanism is incredibly trick. Looking forward to this one. You know how there are reboots of movies? Well now we have reboots of concept cars. The Beetle Dune Concept appears again, much like it did in 2000. This time it's on the latest Beetle design and seems to have a GTI drivetrain. VW will also show off the US-spec Golf R, which will have 290 horsepower and your choice of a DSG or manual transmission. You con't be able to choose the number of doors though: Four is the only one, no two door on this generation. There will also be the Passat BlueMotion Concept, a 1.4 liter gas powered Passat that gets the fuel mileage of a hybrid or diesel, without using either. Very cool tech. Audi will have the Audi Allroad Shooting Brake Concept which is a crossovery thing that might preview two different parts of the brand. First is the newest Q-SUVs, second is the next TT. It's one or both, but definitely not neither. So they'll have the new Cooper there, but they might also have that mysterious four-door Cooper that we hope was some sort of bad dream. The Mini John Cooper Works Concept version of the new Mini should also be there. The Four-Door 2015 Mini Cooper: Why God Why? Honda will have the 2015 Fit, the latest take on the smallest car in the range. The looks are quite promising and it gains a little bit of power. Color us intrigued. Kia will have the Stinger GT4 Concept, a rear drive coupe with 315 horses and a manual transmission. If this car doesn't pull at your heart strings, why are you reading this website? Could Nissan&apos;s Detroit Sports Sedan Concept Be A Datsun 510 Revival? The 2015 Genesis and it's boatload of tech features will make their debut. Is this car enough to make the Equus obsolete? Probably. The gorgeous Volvo Concept XC Coupe will show its face. This XC90 preview shows the new face of Volvo, and if the production car is anything like this, we have a lot to look forward to. Liking this a lot. BMW has the M4, so Lexus had to show off something equally powerful. Meet the RC-F, Lexus's V8 powered coupe with 460 horsepower and the largest grille this side of Texas. There are big fender flares and scoops all over. Will it be better than the M4? Not sure. But it's solid that we still have competition like this in the midsize premium import sport coupe segment. Right? Infiniti will also use the show for performance, showing off the Q50 Eau Rouge, named after the famous corner at Spa. Powertrain options are unknown as of yet, but styling is supposed to take inspiration from the Red Bull RB9 F1 car. There is an extensive use of carbon fiber and some F1 styling cues, like barge board-esque side pieces. The WRX STI. That's all you need know. A 300ish horsepower rally weapon with a giant wing, gold wheels, and blue paint. We think it looks great, though some of you think it isn't aggressive enough. We've heard that it will also be manual only, though there is a shot that it'll also have a double clutch transmission. Maybe. The ATS Coupe will make its first appearance. Whether that's joined by an ATS-V, we don't know just yet, but it seems doubtful at this point. The ATS Coupe will be an ATS with two less doors. Most coupes have two doors. Just thought you'd like to know that. Acura has the TLX, which is the replacement for the TL. If history is any guide, the new one will look just like a TL with 16 headlights. And possibly a hybrid system. Not sure what Elon has up his sleeve, but it isn't the less expensive model they've been talking about. That'll appear at the show in 2015.